Theresa Ragan: KINDLE WORLDS - GOT STORY? KINDLE WORLDS - GOT STORY? Ever think of writing fan-fiction? Me neither. 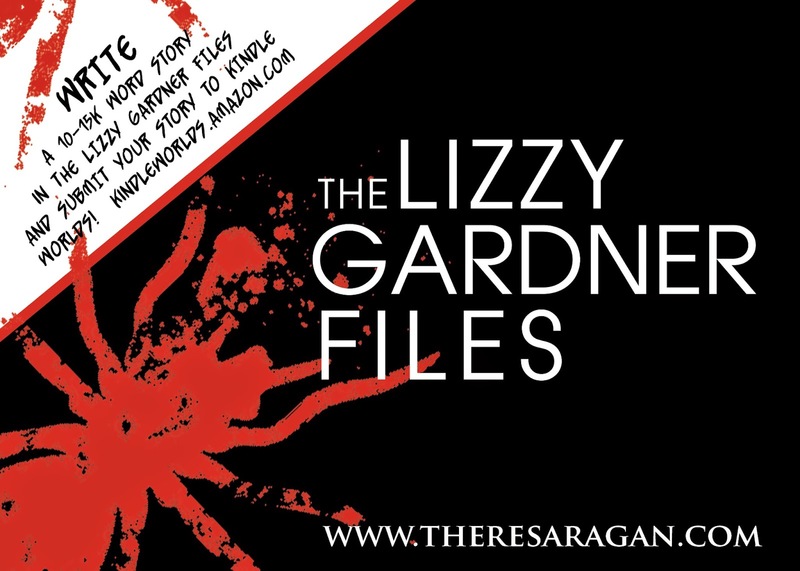 It never once crossed my mind...not until Amazon contacted me to see if I was interested in making my Lizzy Gardner series into THE LIZZY GARDNER FILES on Kindle Worlds. The idea intrigued me. The thought that Lizzy Gardner fans could try their hand at writing a story in Lizzy's world made sense. What the heck? What did I have to lose. As it turns out...absolutely nothing! Recently, I asked one of my favorite mystery writers and good friend, Jana DeLeon, if she might be interested...pretty please...in writing a short story in Lizzy's world. Jana is so awesome, she said, YES! Although Jana writes cozy mysteries, she also writes horror and in this short story, Jana's dark humor shines through. Get your copy of UNSAVORY today. You're going to love it! Hey, Jana. Thanks for agreeing to talk to me and BIG THANKS for writing in my Lizzy Gardner World. I know you’re super busy and it wasn’t an easy decision to make time to write in someone else’s world. What made you finally say YES? It was probably three things. First, I love your Lizzy Gardner series and I think you’re awesome. And I thought it would be fun to get WAY outside of my normal box and try my hand at a little thriller. The thought of being able to get in a little dark humor may have also tempted me. I wrote my own short story for Kindle Worlds in Blake Crouch’s Wayward Pines world. I have to say it took more time learning about his world than actually writing the story. How about you? What was the most difficult part of writing in Lizzy’s world? I’d already read all three books, but my recall is not all that great. I definitely spent time looking things up and asking you questions. J Heck, I can’t remember my own story timelines when I’m writing, so trying to remember someone else’s well enough to add to it is a lost cause. So yeah, probably more research and fact checking than actual writing. Your cover is awesome. Can you tell us about it? I wanted something that looked similar to your covers. I am a hack at Photoshop, but I can do simple stuff. I went with a single image, like your covers, and felt the knife on the black background was the perfect combination of simplicity and foreshadowing. I found fonts for type that were similar to the ones used on your covers. I’m glad you liked it! How was the process overall? Fun, stressful, horrible? Or let’s put it this way…is this something you would consider doing again—you know, writing in someone’s else world? And please give us details…for instance, were you complaining to your husband every night? Ha. I am always somewhat stressed because I live at least one month behind on deadlines. I need to just accept that’s the way it will always be and move on. LOL In addition to writing in your world, I am also challenged by the short story format. Until last year, I’d never written one. Ever. UNSAVORY is my third short story and I’m getting better at it. Because I write mysteries, I’m already used to writing tight and fast pacing, but what I have to dial myself back on with short stories is plot. I usually have several twists and turns in my mystery plots, and I simply don’t have the room for that in a short. I didn’t complain about writing it at all. There are so many other worse things that I wore my husband out with. I had a lot of fun coming up with the characters and the scenario. In one way, it was much harder because they weren’t mine so I had to figure out how to mimic your voice and style. But in another way it was easier because the main characters and the setting were already established, so no creating them from scratch. If I could find more time, I would definitely consider doing it again. I can’t thank you enough for agreeing to do this, Jana. You already know that I think you’re super special, but now I owe you one. Thanks a bunch. With hard work and perseverance, dreams really do come true. Believe!